Annie Kim. 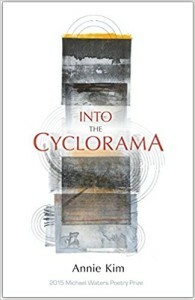 Into the Cyclorama. University of Southern Indiana Press, 2016. It’s often said that wonderful and terrible events shape those who experience them, and in Into the Cyclorama, Annie Kim explores what shapes exactly they create. This book, winner of the 2015 Michael Waters Poetry Prize, brings together twenty-eight poems that don’t simply play with form, but manipulate lyrical construction, strengthening the theme of a given piece, whether examining the lonely displacement of moving from house to house, or the desolation of lost faith after a sudden death. Structure becomes content highlighting the ways one is altered, often permanently, by life’s events, even when they seem innocuous. The book begins with an epigraph from Hesiod’s The Shield of Herakles, which describes the shield, with a Gorgon’s head surrounded by silver and gold, terror and beauty in harmony. This serves as a powerful precursor to the poems, offering a mixed image of something deadly designed to lure people toward danger, as well as a bad situation surrounded by good tidings and silver linings. “Thin Gold String,” the first poem, explores this well, describing escalating tribulations like a button falling off a beloved antique coat, soon reaching “Each heartbreak swooping in for its/ own black bit of universe.” Soon, it culminates in a need to “hold it all before your eyes, grab/ both ends of this thin gold string.” This poem is a series of couplets, beginning and ending with a single line, physically emulating this idea, showing how easy it can be to hold on while the words emphasize the need to let go. “Portrait with a Blurred Tattoo” shows Kim’s use of structure again in this piece about a woman gradually losing the ability to care for herself as she ages, suffering from dementia or Alzheimer’s. It begins with a description of the portrait sitting by herbed, describing the woman and son as they were when younger. The third line is set off, indented farther than the others, saying they were “still perfect, unwrinkled,” while describing the son two stanzas later as “embarrassed by the moment.” This poem is full of breaks to show a change of scene, and the next brings an image of the mother, wearing a bib to keep drool off her clothing, her body withered and weak, when the son looks away, “his mouth a fist.” Two breaks later, the piece ends with a moment of clarity for the old woman, where she “seemed to want to lose” as she laughs and forfeits a card game. Kim’s dedication to using structure as a means of altering content has an impact in “More Words for Snow,” which has a couplet and two tercets, followed by a couplet indented from the other lines, then a tercet, a quatrain, and another tercet. These lines begin with gentler phrases like “Toothless, houndless” and “Unsplittable.” The lines set off to the side interrupt the snow imagery, reading, “Don’t go home yet—touch me—/ I remember how you looked.” Like a cracked mirror, this section creates a distorted reflection, with the ending lines showing a different interpretation of snow. “Grief machine./ Killer of taxicab drivers/ and kids in new buses.” The split in the middle, the calling to mind of a trauma that spoils the recollections of more youthful times, has the feel of a volta, dropping a new tone, leaving space for the reader to fall into its darkness. Annie Kim is the a uthor of Into the Cyclorama, winner of the 2015 Michael Waters Poetry Prize (Southern Indiana Review Press, 2016). Her poems have appeared, or are forthcoming, in journals such as The Kenyon Review, The Cincinnati Review, Pleiades, Four Way Review, Ninth Letter, and Crab Orchard Review. 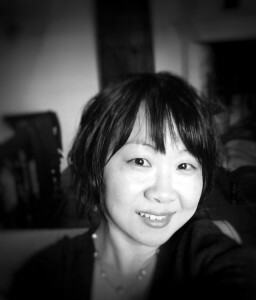 A graduate of Warren Wilson College’s MFA Program for Writers and the recipient of fellowships from the Virginia Center for Creative Arts and Hambidge Center, Kim is an editor for DMQ Review and works at the University of Virginia School of Law as the Assistant Dean for Public Service. Uses for Music is the title of her second manuscript.